Each moment we have to spend with our children is a blessing from above. But as we cherish this chapter of life, we realize the pages of time will keep turning. Alternating between the voices of a father and his daughter, Cinderella celebrates the blessings of childhood, family, love and life. You will be enchanted by this modern fairytale that teaches us how to hand our own Cinderella her glass slippers and let her go. 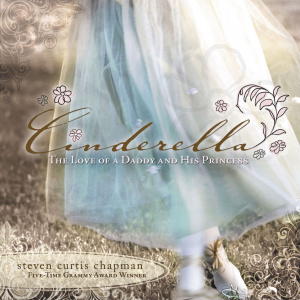 Cinderella : The Love of a Daddy and His Princess by Steven Curtis Chapman was published by Thomas Nelson in May 2008 and is our 26901st best seller. The ISBN for Cinderella : The Love of a Daddy and His Princess is 9781404105225. Be the first to review Cinderella : The Love of a Daddy and His Princess ! Got a question? No problem! Just click here to ask us about Cinderella : The Love of a Daddy and His Princess .